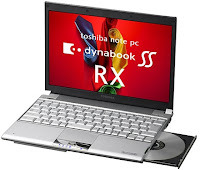 Not so long after the launch of the Toshiba 64GB SSD now comes the all new Dynabook SS RX1 with nothing less than 120GB SSD this impressive baby has a 12.1 inch display along with internal KDDI EV-D0 data module, 1.2Ghz Core 2 Duo U7600, 2GB memory Intel 945GMS Express graphics, a 1,280 x 800 pixel panel resolution, and choice of 6.2 hour or 12.5 hour batteries. Pricing to be slotted at $4000 initially available for the Japanese market only, hope it reaches our shores soon. I however will still be waiting for the prices of SSDs’ to drop further to make the shift. Previous Gamers Cockpit GT3 racing simulator has everything you need!